We got a small bag of roselle in the pick box this week. Just a few ounces, not really enough to make a batch of sorrel or roselle jam. But we have a lot of pomegranates from the garden and, although we love to just eat them out of hand, they were piling up. The only problem with our pomegranates is that they are not the bright red that you see in the store. The seeds are more often clear or a rosy pink. 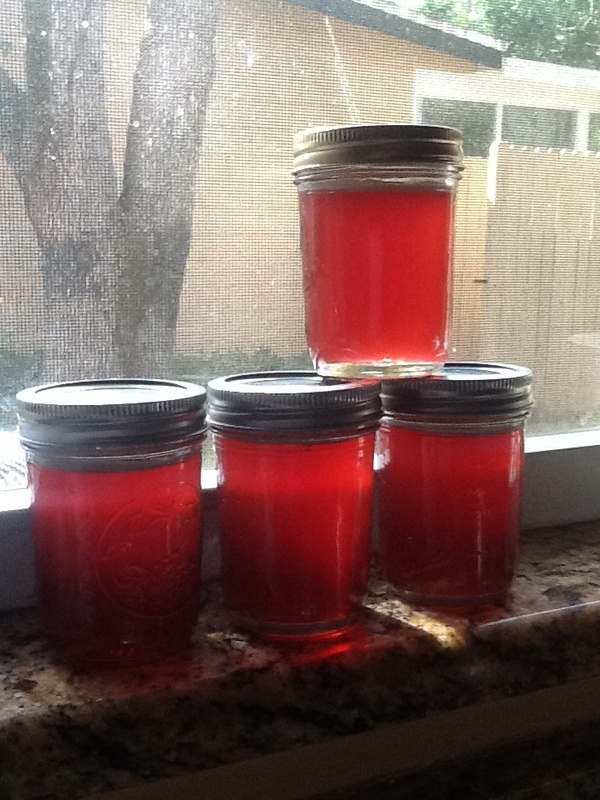 So I mixed the pomegranates and the roselle, which have a fabulous red color, and made this gorgeous crimson jelly. Remove the calyces from the seed pods of the roselle. Place the seed pods in a large non-reactive pot and set the calyces aside. Add just enough water to cover. Boil for 30 minutes. Add more water as necessary. These boiled seed pods contain the pectin that will ultimately set the jelly. In the meantime, Remove all the seeds from the pomegranate. After 30 mins remove the seedpods from the water and compost them. Add the pomegranate seeds and the roselle calyces to the pot and add enough water to almost cover. Gently boil, covered, for one hour. Scoop the mixture into a jelly bag (or make your own from cheesecloth and a couple of wooden spoons) over a large bowl and leave to drain for a few hours or overnight. Do not press on the mixture. Compost the seeds and pulp and measure the juice. Pour the juice into the clean pot and add an equal amount of sugar (or slightly less if you prefer a sharper taste.) Add the juice of one lemon. Boil until the mixture reaches 225 degrees F. Skim off the foam for a clearer jelly. Pour into clean jars. My eight pomegranates made four small jars. So this is not a recipe to make with store bought pomegranates! Way too expensive.